Great for Families & Groups on a Budget. This Hi-Top Camper comes with all the bells and whistles! It has 7 seatbelts and sleeps 2 inside. 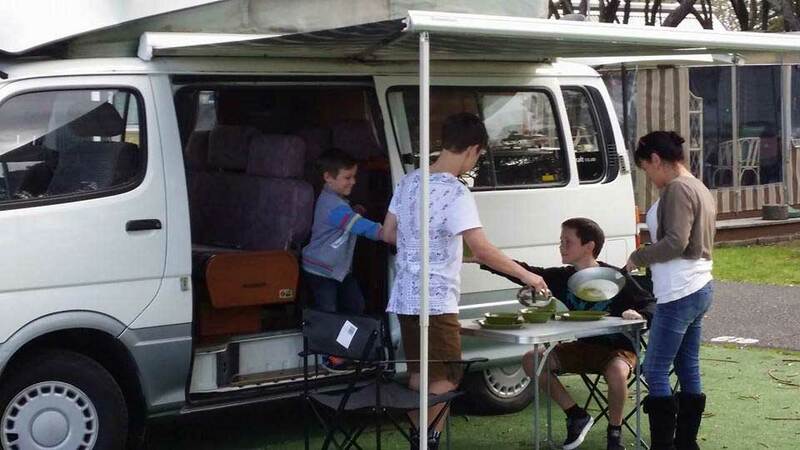 With the addition of a tent, this camper is perfect for families on a budget. Two people can sleep inside and others can sleep in a tent outside under the awning. 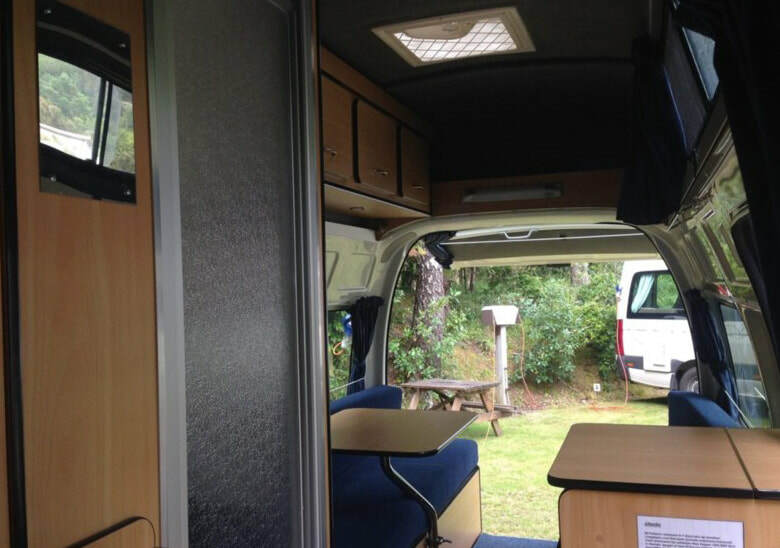 This camping option is very economical as the rental cost is for just a 2 berth campervan and tent hire (if required). 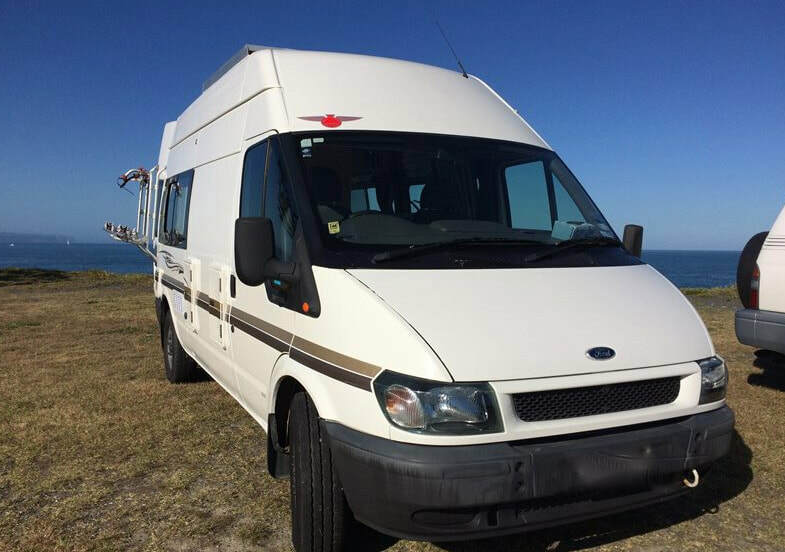 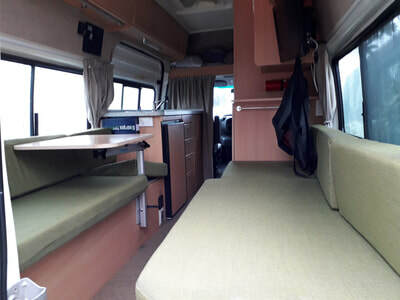 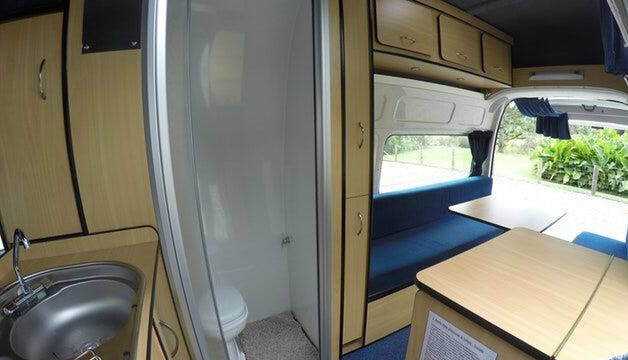 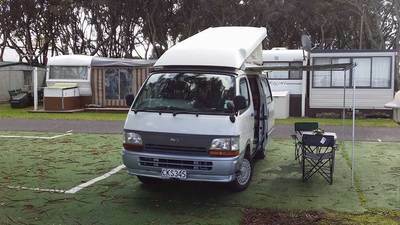 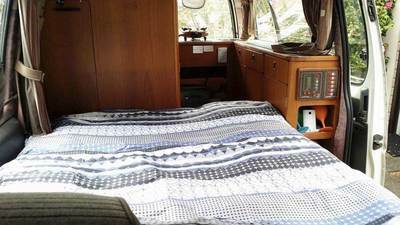 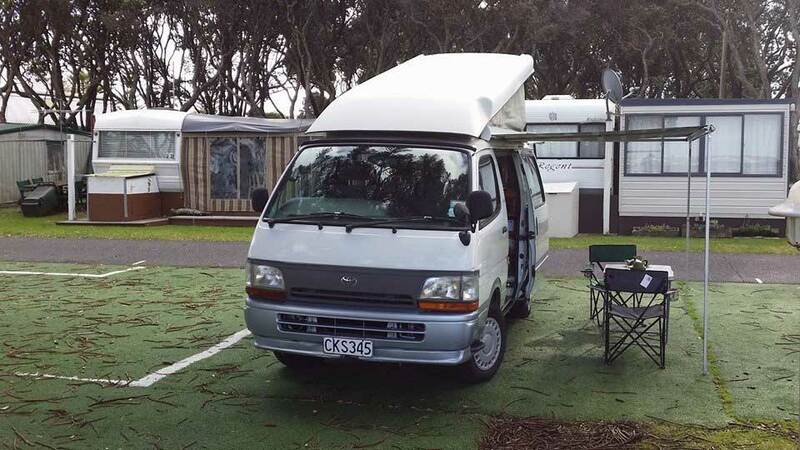 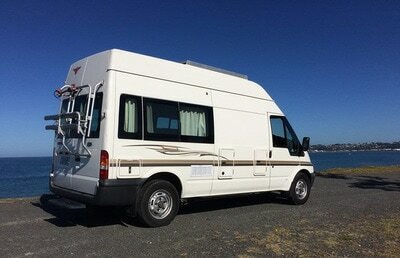 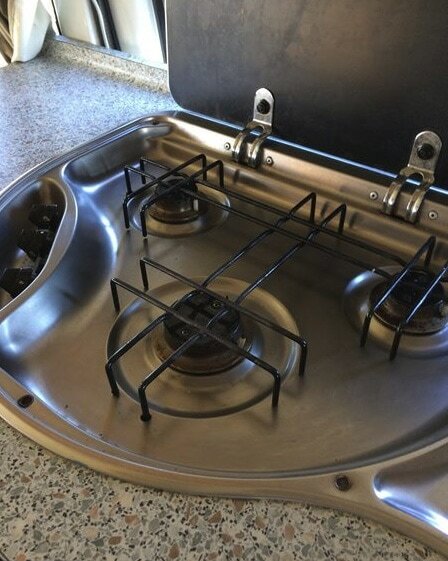 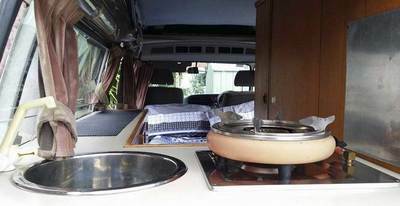 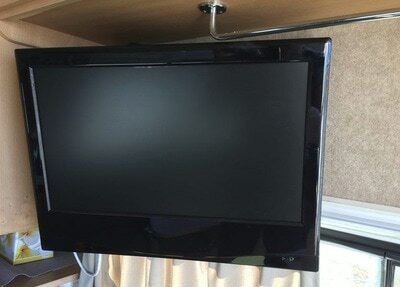 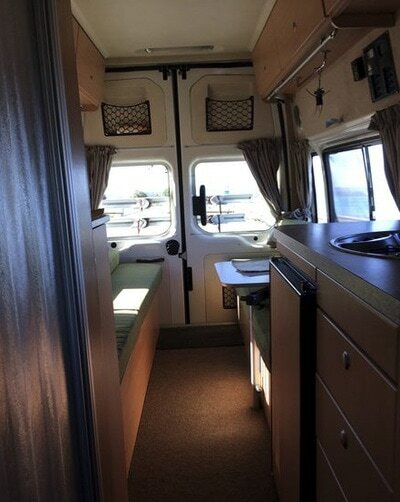 This campervan comes with an indoor gas cooker & gas bottle, interior hot shower & toilet. 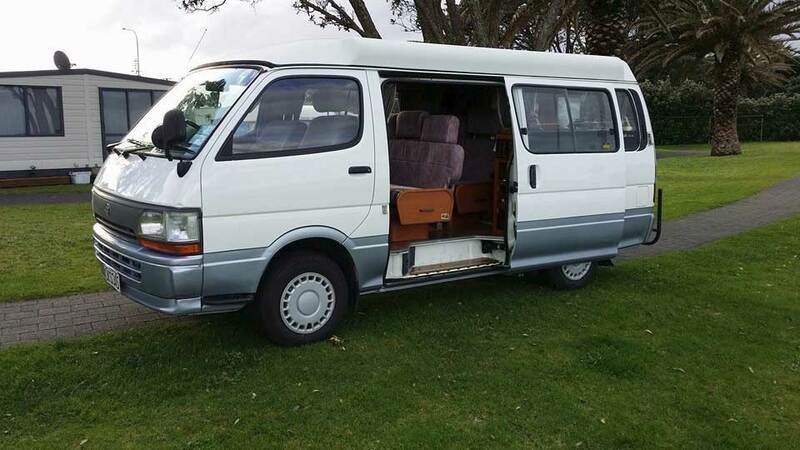 The van has a pop-top roof which gives you the benefit of more head room inside but converts to normal height for driving. 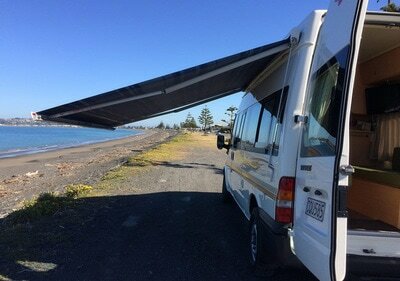 The pull out awning easily stores away under the pop-top roof. 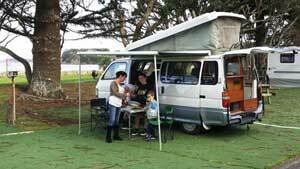 Outdoor Living: Table & chairs, awning. 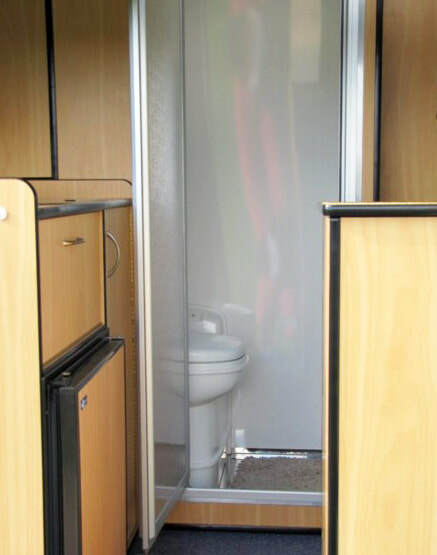 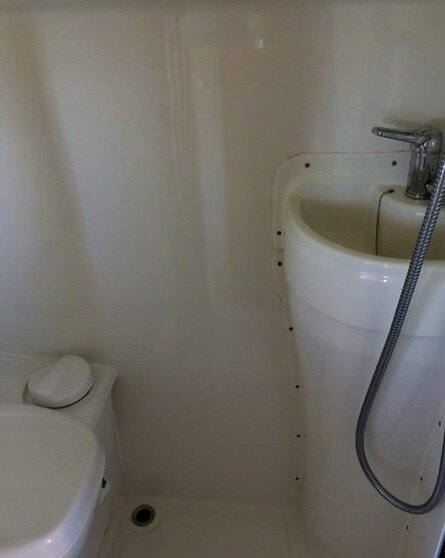 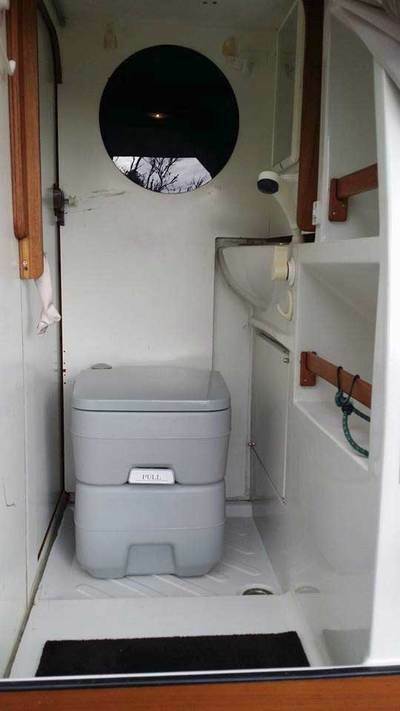 This reliable Toyota jumbo has an extra high roof and built in shower/toilet room. With 3 seatbelts the wide bed could fit 2 adults and a small child; making it a cheaper option for small families. 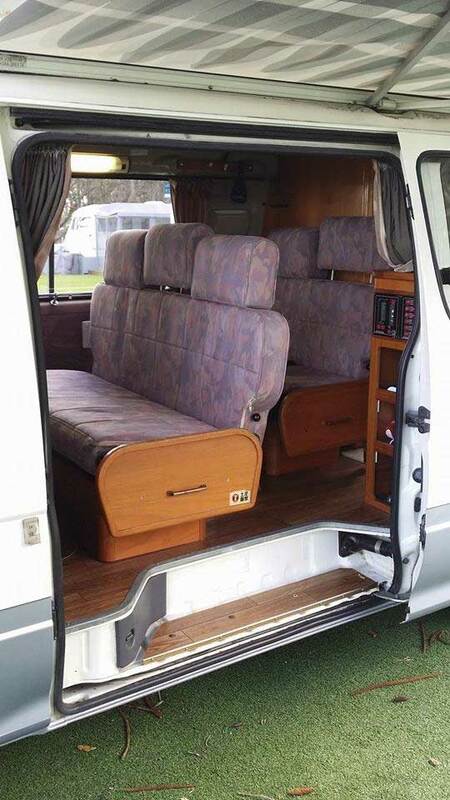 3 seatbelts in front (2 x shoulder, 1 x lap belt). 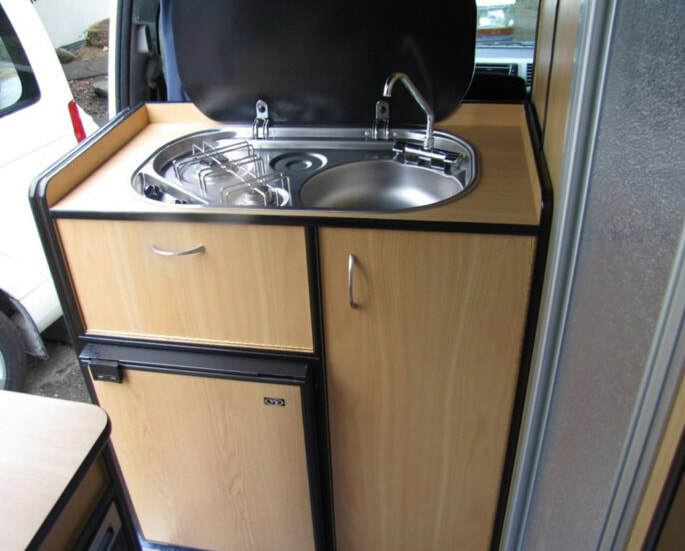 Kitchen & dining: sink with hot water, 2 ring gas cooker, 2 way fridge with freezer. 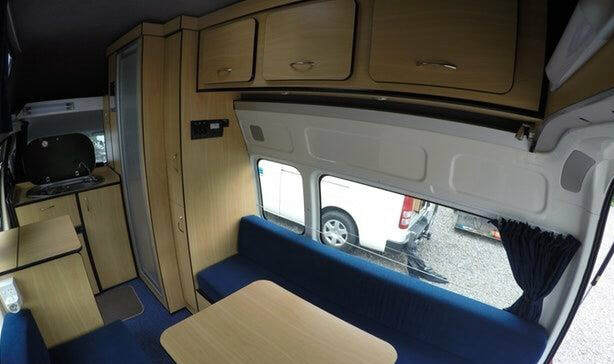 Lots of storage; Overhead cupboards, wardrobe in the right, great storage above the cab, in the high-top back/end of the camper, behind drivers seat and under bench seats in back. 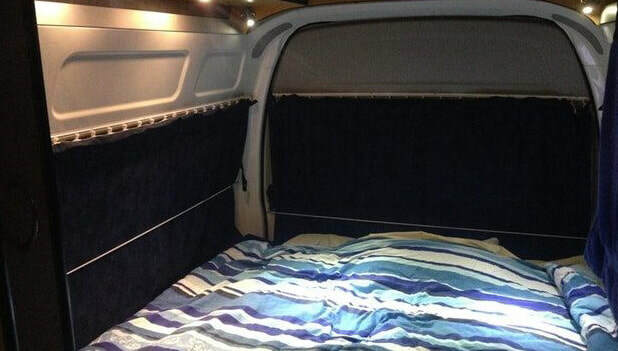 The backdoor is ideal as protection against the rain (canopy). 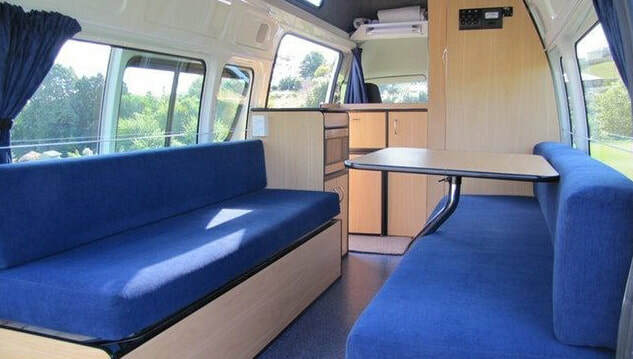 These 2 Berth campervans are all certified self-contained. They come fitted with toilet & shower room, fully equipped kitchen facilities and a comfortable bed, either 2 singles or 1 double bed (depending on vehicle). 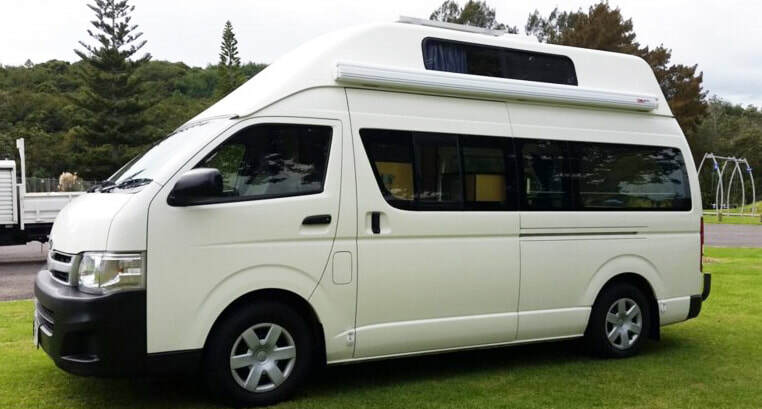 Enjoy the convenient awning on the side of the vehicle when you need weather protection.